Welcome to B & B Shiba's website. 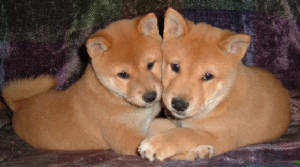 We are breeders of cream, red and sesame Shiba Inu's (柴犬), and are located in Sacramento, California. On this home page, you will find links to our Shiba's, information about us and our policies, resources to contact us, current and past litters and also information and history of the Shiba Inu breed itself. Our Shiba's are purebred, house-raised, spoiled rotten and registered with AKC, ACA, and/or CKC. Our ultimate goal is to produce happy, healthy, pure-bred family companions who are free from genetic disabilities, defects and diseases.